Northern Ireland border towns are enjoying a surge in business, with visitors from the Republic of Ireland cashing in on the pound's low rate. 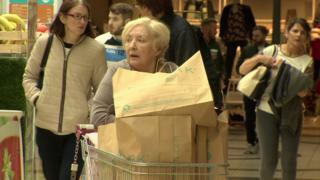 One Newry shopping centre has seen a 62% jump in customers from across the border. The boom has been fuelled by sterling's decrease in value - after the UK's Brexit vote in June. It means, for example, a 128GB tablet device is about 90 euros (or £80) cheaper in Northern Ireland. Peter Murray, the manager of Newry's Buttercrane shopping centre, said it had been "a real beneficiary" of the referendum currency swing. "At the minute it is good and going to stay good up until Christmas, which is great news for border areas," he said. A euro was worth £0.76 on 23 June, compared to about £0.89 now. It gives Republic of Ireland visitors increased spending power on trips to Northern Ireland. Online price checks also reveal significant savings on some items. The same well-known brand of whiskey is 27 euros on shelves in the Republic of Ireland - but in Northern Ireland it is £15 - the equivalent of 16 euros. "At the moment places like Newry and Derry are winning," said the chief executive of the CBI in Northern Ireland, Angela McGowan. What does Brexit mean for the Irish border? "But in the longer term what is going to happen with trade and the border? "We do not know how Brexit is going to end up." The Northern Ireland tourism sector is also getting a so-called Brexit bounce from Eurozone visitors - which helped boost hotel occupancy to record levels in August.